University of Maryland's Public Health Garden is a community and public garden that is home to various plants and fruit bearing trees, such as apples, parsley, pumpkins, and other herbs and flowers. The garden promotes the importance of health, wellness, and a healthy diet. Community volunteers maintain the garden. Students and faculty use it to gain valuable hands-on environmental and community health experiences. Innovations are being made to improve soil fertility and utilize drip irrigation. Crop yields are used for local consumption, which decreases the environmental impact caused by transportation, and environmental research. 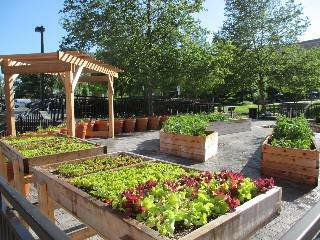 The Public Health Garden is located between University of Maryland's School of Public Health and Eppley Recreation Center. Volunteers are welcome.